Once again it Uttarayan or Makar Sankranti. Uttarayan is the Gujarati name for the festival celebrated all over India. Be it Pongal, Lohri,Magha Saaji,Suggi,Ghughuti or any other name, it basically celebrates the transition of the sun from the Tropic of Capricorn which is in the south part of the world to the north. It marks the ending of the winter solstice. The festival is also dedicated to the Sun God. It marks the end of the evil Poush (Kamudta) month. It is believed that Bhisma Pitah in spite of being on a bed of arrows and in grave pain, waited for the sun to be in Uttarayan to willingly die. Its also the period when the Gods awaken from their deep slumber. This festival is celebrated with a feeling of anticipation, joy and jubilation. Gujarat celebrates this festival over two days. The next day its called Vasi Uttarayan, meaning stale Uttarayan. I have no idea why its called Vasi Uttarayan. Usually during this festival most Gujarati homes prepare Undhiyu (winter vegetables cooked in with spices in an earthen pot), tal sakri (fudge made with sesame seeds and jaggery) or tal ladoos. The people of Gujarat celebrate this festival by flying kites. Its a time when relatives and friends meet outdoors, and all ages and gender enjoy flying kites in all sizes from the rooftops. Friendly competitions are held as to who can sustain their kite in the air for the longest time. The threads are sometimes laced with broken glass so it becomes easier to cut an opponents kite. Kites are made from very light paper and bamboo. Before Uttarayan, kite making becomes like a cottage industry for many homes. The skies all over Gujarat are doted with a variety of colours. It is believed that many years ago kite flying was enjoyed by the Kings and Nawabs who showed off their prowess and was a form of entertainment also. Trained kite fliers were employed. Slowly kite flying became popular with the masses. Ahmedabad, the kite capital hosts the International Kite Flying Competition during Uttarayan. During this joyous and vibrant festival, Pushpita a food blogger at Ei Gi Chakhum invited me to do a guest post. Pushpita, I’m so honoured for giving me this opportunity. In five years since I started blogging, this is my second guest post. So what do I say about Pushpita? Well, she’s a friend I haven’t met as yet face to face (which hopefully one day I will) but we meet constantly on our Foodie Monday whatsapp group. I met her when she joined the group just a few months after me. She’s a very friendly, helpful, caring and warm person. An economist by profession, her love for food led her to blogging. Through her blog she’s opened up a whole new world for me through her speciality dishes from the North Eastern part of India, especially Manipur. Friendship with her proves that age is no bar, she’s way younger to me but that does not stop us from sharing happy and sad moments. Please do check out her blog Ei Gi Chakham. Coming to today’s special recipe for Uttarayan, I’ve already made the famous tal sakri so I decided to make a fusion version. Since its auspicious to have tal (sesame seeds) and gur( jaggery) on Uttarayan, I made it using tal and gur but its not too sweet and its healthy as I’ve also added cocoa powder to it. Its a simple and quick recipe. 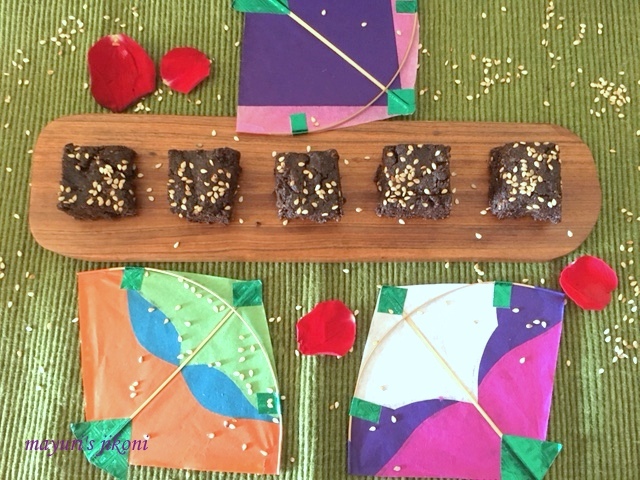 So read on to find out how to make chocolate sesame fudge. Grease a 6″X6″ with a little ghee. Grind the sesame seeds in a grinder till it begins to become like a paste. Remove the ground sesame seeds into a bowl. Add cocoa powder, cinnamon powder, cardamom powder and chilli powder to the ground sesame and mix very well. Add jaggery and ghee into a thick bottomed pan. Heat the mixture over low heat, mixing it all the time till the jaggery melts and begins to bubble and froth. Add the melted jaggery mixture to the sesame mixture. Mix it well. Transfer the mixture into the prepared tin. Pat it down evenly. Sprinkle sesame seeds over the fudge and press it down gently with your fingers. Let the fudge set for 2-3 hours. Cut into squares with a sharp knife and serve. This fudge is a great treat for those who want to eat healthy but crave for something sweet.Its not sweet at all. If you want to make a sweeter fudge take half unsweetened cocoa and half sweetened cocoa. Adding red chilli powder is optional. I added it as it reminds me of the chilli chocolate. Did you know that you can shorten your links with AdFly and get money from every click on your shortened links.